Reflecting, I realized that there would be no notice from any level of hierarchy. I am not well known, influential, wealthy, or powerful in any manner. My puny action will not be felt and have no impact. Then I realized that what was needed was not someone with lots of money, renown or power – what was needed were more fleas. The Old-World hierarchs, whatever their motivations may be, are not interested in an American united autocephalous Church. Their representatives in America, Metropolitans and Archbishops, are either not interested in an American Church or will be obedient to their Patriarchs. The bishops will also align themselves with their leadership and the Priests will remain silent (no matter what most of them may think). There is no one that will listen to the Laity of the many jurisdictions in America that long for our own American Orthodox Christian Church. There is no one to take up our cause. Only The Body of Christ. Only an Army of Fleas. 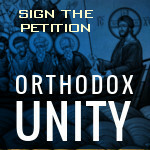 The OCL website offers a petition to be sent to the Old-World Hierarchs. If you agree with the statement contained on the document, please add your name. Ask your household to consider adding their names. Share the petition (via link or email) with your friends so that they may add their names.